It's been a heck of a day for feminist nonsense. Katie wrote about how Joan Walsh questioned Ivanka Trump's "girlie" wardrobe, while Reagan relayed Chelsea Handler's comparing Capitol Hill to Abu Dhabi, thanks to a dress code that has been the norm for a century. Their idiotic remarks were just surpassed by the stupidest tweet of the day (so far). Of course, she didn't get away with it. Social media users quickly pointed out her hypocrisy. 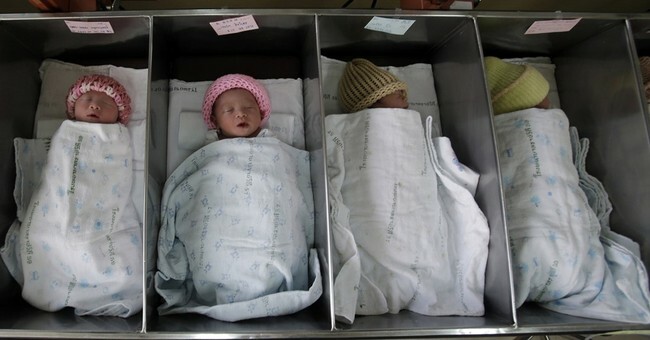 Does Filipovic want us to emulate China, where women are often forced to have abortions or cough up major fines to fall in line with the cruel two-child policy? The one-child policy was enforced until last year, when the government announced it would let families have two children. As many as 7 million abortions were recorded annually, according to China's Health Ministry. In the Guardian piece Filipovic tweeted, Environment Editor Damian Carrington cited a study published by Environmental Research Letters. One fewer child, the researchers determined, would save 58.6 tons of CO2 per year. Americans would be especially apt to limit their carbon footprint, the study suggested. Overpopulation has been a controversial factor in the climate change debate, with some pointing out that an American is responsible for 40 times the emissions produced by a Bangladeshi and that overconsumption is the crucial issue. The new research comes a day after researchers blamed overpopulation and overconsumption on the “biological annihilation” of wildlife which has started a mass extinction of species on the planet. In addition to limiting reproduction, humans should also sell their cars, avoid flights, and become vegetarian, the study concluded. These statistics may sound impressive, but the fact remains that childbirth is the greatest miracle of life. My favorite reply came from the Twitter user who shared some biblical wisdom. "Children are a heritage from the Lord." That trumps your fear.